As operators prepare for 5G service launch around the globe, the industry has a reasonable view of how the initial generation of 5G products and services will look and is moving forward with confidence. What’s still unknown is just how great will be 5G’s global impact. According to a recent Heavy Reading Operator Survey, there are striking differences between the U.S. and Rest-of-World (RoW) when it comes to 5G expectations. A majority (52%) of U.S. respondents believe that “faster end-user speeds” will be the biggest benefit over the next five years, while 41% of RoW respondents identified “new services and eco-system expansion” as being the primary commercial benefit over the same timeframe. Most agree that over a five-year view (2018-2023), there will be a wholesale transition to 5G, with 71% of respondents believing that 5G will be a mass-market service by this time. 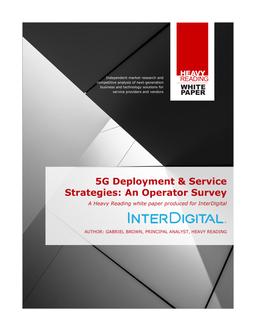 Read this white paper to gain insights into the near-term and evolving operator outlook for 5G network deployment and service innovation.